The URPOWER-Z2 Bluetooth speaker offers great quality sound with Bluetooth 3.0 technology. With the ultra-compact size and the soft touch rubber design, it can be easily fitted into a backpack, suitcase, or a travel bag. The built-in 600 mAh rechargeable battery enables an 3.5-4 hours of playtime on a single charge. This speaker is strong enough to fill up a kitchen, living room, or classroom. It is ideal for personal usage, indoor party or outdoor BBQ or picnic with friends and family. 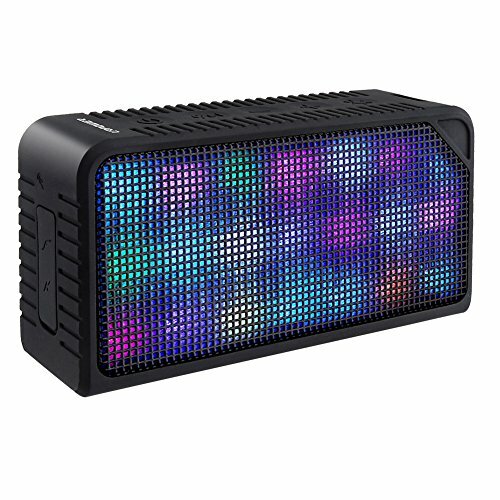 Built-in 16 RGB LED lights,7 kinds of music pulsating LED visual display mode. Built-in high-quality dual voice coil speakers, bright treble, alto mellow, deep bass, bringing you the perfect music to enjoy. Access to volume, track skip and light effects, make it easy to navigate without having to reach for your device. Built-in microphone,for clear voice call. Bluetooth wireless technology allows for an easy simple connection. Playback from up to 31 ft away from any Bluetooth enabled device including, Tablets, Smartphones, IPads, iPhones, Notebooks, PC's and More. Built-in high capacity battery,directly to the computer's USB port charging Up to 3.5-4 hours of music play (depending on the size and source of music). Support Hands-free Function, for iPhone 6s Plus,6s,Samsung,Tablets and More, Bluetooth 3.0 Technology - Connect your device in 3 seconds,instant and stable;Outstanding connection range of up to 31 feet. Equipped with a built-in microphone for hands free calling on the move, seven kinds of music pulsating LED visual display modes. Fast Recharge - Enjoy 3.5 - 4 hours of music at 50% volume. Recharge in just 3 hours using the included Micro USB cable. Compatible with all Bluetooth-enabled devices iPad iPhone Samsung HTC Sony Nokia and equipped with a 3.5mm audio jack for non-Bluetooth devices. Package contents: URPOWER Portable Bluetooth Speaker, micro USB cable, 3.5mm audio cable, instruction manual.